Inscription above the door reads WF 1581 ES. WF was William Forbes who built the castle, and ES was Elizabeth Strachan his wife, daughter of Strachan of Thornton (note that this is incorrectly recorded as SS not ES on the CANMORE website). One of their sons, William, later purchased Craigievar Castle in 1610 and on account of his success as a merchant trader became known as "Danzig Willie". 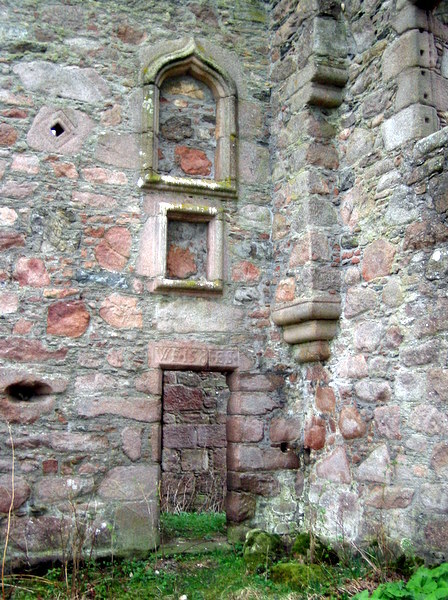 Notice the spyholes to the immediate left, and to the left above the doorway on the first floor. See also image 1007.